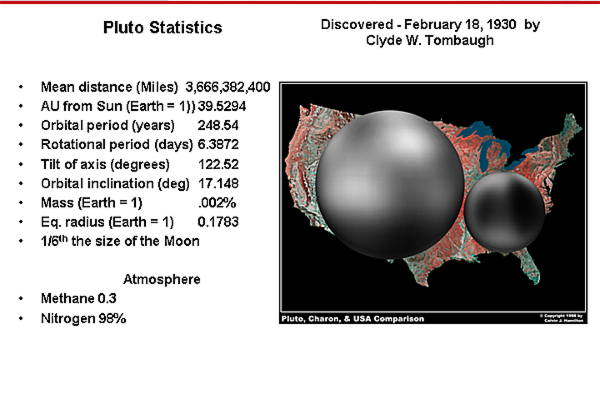 The Kuiper Belt object, Pluto since its discovery in 1930 has revealed little about its characteristics. The NASA/JPL probe New Horizons is now one month away from the start of mission observations of the dwarf planet. New Horizons has been travelling to Pluto for nearly 9 years. After a journey of more than 8 years the spacecraft was wakened from hibernation for the last time on December 6th, and is now in the process of preparing all of its sensors for active science operations. The hope of the mission team is that all of the sensors will work flawlessly over the next 12 months as the spacecraft approaches Pluto, and its 5 moons. Scheduled to flyby Pluto within 7700 miles in July, the craft is currently 130 million miles from its encounter. Are there more than 5 moons? Does it have active surface features? What type of atmosphere does it have? There is concern that as the craft approaches the tiny planet and its moons that obstacles might lay ahead that could destroy the craft. The team will be performing sensor studies of the path ahead to identify potential obstacles such as dust, tiny debris the size of pebbles, or other potential hazards. If anything is found the craft has enough fuel onboard to adjust the trajectory and avoid hazards. At the completion of the flyby, the craft will continue to fly on into the Kuiper belt. The Hubble Telescope helped identify several potential targets for New Horizons over the summer. The mission team has yet to pick the follow on target, preferring to stay focused on the mission at hand. Congress would need to allocate funding for the follow on mission.